Former Iranian President Mahmoud Ahmadinejad has written a formal letter to President Barack Obama urging him to “restore people’s rights” by returning $2 billion in Iranian assets that were frozen earlier this year. In April of 2016 the U.S. Supreme Court ruled that $2 billion must be paid to American families that lost family members in the Beruit and Saudi Arabian military attacks that took place in 1983 and 1996 that were reportedly carried out by Iranian Radicals. Iranian officials were outraged by the ruling, calling it “highway robbery” and “property seizure.”Ahmadinejad also used the letter to criticize Obama, mocking him for being unable to deliver the “change” promised in his presidential campaigns. He denies reports that the attacks were committed by Iranian radicals and claims the Islamic nation played no part in the attacks. The letter was delivered to the White House via the Swiss embassy in Tehran. The Swiss embassy represents U.S. diplomatic interests in Iran. 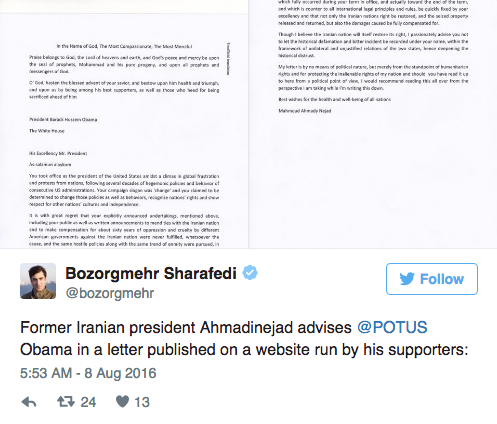 While the letter was delivered via the embassy it was first posted on the Dolate-Bahar website a pro-Ahmadinejad website run by his supporters. 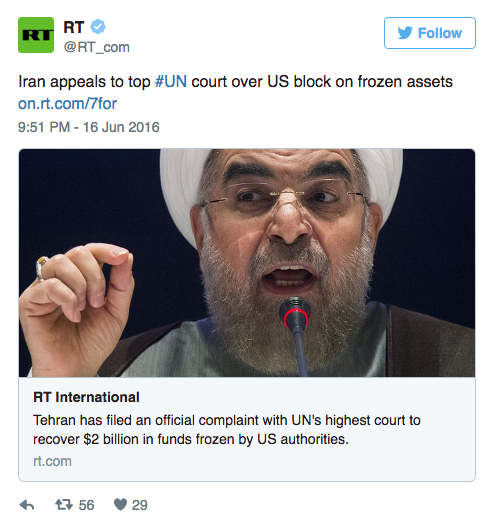 He claims that this seizure of assets will deepen Iran’s “historical distrust” of the United States. The Iranian government refuses to allow the seizure to happen without opposition. They have filed an appeal with the International Court of Justice. Ahmadinejad claims that the seizure was unlawful and claims that the letter isn’t political in nature but rather a plea to Obama to prevent the distribution of the funds before it is too late. Japan On 3-Month High Alert After North Korea "Declares War" On U.S.